The Monaco Yacht Club has been bringing young sailing enthusiasts together for the Monaco Optimist Team Race for a decade now. To celebrate the tenth edition this year, 16 teams from 16 different nations made up of 64 sailors under the age of 14 made a real show amidst the yachts in Port Hercule, as they brought their support to peace through sport. For the second year in a row, the Monaco Yacht Club joined forces with Peace and Sport to maximize the presence of these international young sportspeople, cooperating to promote sport as a tool for social change. 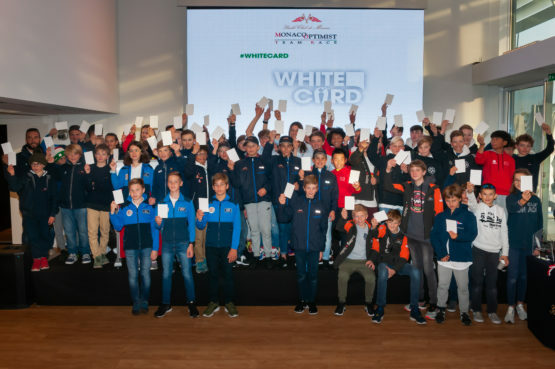 To mark the occasion, the 64 youngsters posed together for a #WhiteCard photo – a symbol of peace and solidarity through sport. Uruguay, the Netherlands, Norway and Belgium stood side by side in the politically-neutral territory of Monaco. Above and beyond sport, year after year, this event is an opportunity to bring young sailors from around the world together to share their common passion and their culture. The races were organized in games of four teams of Optimists, which highlighted the technical qualities, tactics and united spirit of each participant. Nearly 120 races took place and no concessions were allowed for these budding young enthusiasts.